Special offers in the store! The Daedric Prince of Madness has commandeered The Elder Scrolls: Legends, offering up exclusive sales every day for a limited time. That's right, it's the Festival of Madness! 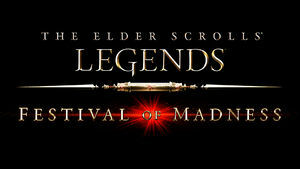 The Festival of Madness was a limited time event which offered a special sale every 24 hours (with the exception of a few deals lasting 48 hours). The event began on 20 November 2018 and ended on 1 January 2019. Sales could be bought with Gold and/or real-world money. Several previously limited-time bundles returned during this event, as well as 2 new cards, 2 new titles, and 2 new card backs. 10 Storm Atronach Bundle Contains five Core Set card packs, 800 Soul Gems and the Storm Atronach card back! - USD $14.99/€14.99 This card back was previously available in the limited-time Atronach Bundle. 14 Variety Pack Contains four Core Set card packs, three Heroes of Skyrim card packs, two Houses of Morrowind card packs and one Legendary card!! - USD $9.99/€9.99 The legendary card was from the Core Set. 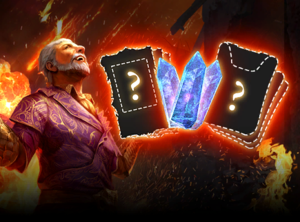 19 Flame Atronach Bundle Contains ten card packs, 800 Soul Gems and the Flame Atronach card back! - USD $19.99/€19.99 The card packs were from the Core Set. This card back was previously available in the limited-time Atronach Bundle. 25 Unlimited Premium Legendary Pack Contains one premium Houses of Morrowind Legendary card and can be purchased multiple times! 1000 USD $7.99/€7.99 Can be purchased multiple times. 29 Isle of Madness Sneak Peek Pack Contains four Houses of Morrowind card packs, four Heroes of Skyrim card packs AND three copies of a preview card of the Cheesemancer from Isle of Madness! 2000 USD $9.99/€9.99 Cheesemancer was later made available via soul summoning after the release of Isle of Madness. 32 Epic Pack Bundle Contains 25 Houses of Morrowind card packs, 25 Heroes of Skyrim card packs AND a premium card back of Hollowjack! - USD $49.99/€49.99 The Hollowjack card back is only obtainable through this purchase. 35 Epic Pack Bundle Contains 25 Houses of Morrowind card packs, 25 Heroes of Skyrim card packs AND a premium card back of Psijic! - USD $49.99/€49.99 The Psijic card back is only obtainable through this purchase. 39 Isle of Madness Sneak Peek Pack Contains three copies of a premium card that can put Isle of Madness cards in your hand AND four packs each of Houses of Morrowind and Heroes of Skyrim! 2000 USD $9.99/€9.99 Madness Beckons was later made available via soul summoning after the release of Isle of Madness. 41 Utter Madness Bundle Savings as mad as Sheogorath himself! Contains 25 Core Set card packs, 35 Houses of Morrowind card packs, 30 Heroes of Skyrim card packs and a special player title: "Cheesemonger." - USD $69.99/€69.99/£59.99 This is the only way to receive the title "Cheesemonger". 42 New Year's Countdown Bundle Contains the Return to Clockwork City card back and 1,000 soul gems! - USD $9.99/€9.99 This card back was previously only available from purchasing the Clockwork City Triple Bundle. The following cards were previously available only as part of the Festival of Madness. After the release of Isle of Madness, they can now be soul summoned instead. Cheesemancer Creature (Imperial) Neutral 5 4 4 3 Epic At the start of the game, Cheesemancer gains the ability of a random creature from Isle of Madness. Buying all deals (and taking the gold option where both were available) would have cost at least† 17310 and USD $345.84/€345.84. On the other hand, taking the cash option every time would have cost at least† 4310 and USD $459.74/€459.74. †The day 25 deal could be purchased multiple times; these totals only account for buying it once. This page was last modified on 27 January 2019, at 14:27.